Tough battle in Alicante, as Real Madrid visited Elche for another La Liga fixture and only managed to come out with the 3 points in the very last breath of the game. The Merengues won the encounter by 1-2 and Cristiano Ronaldo scored the opener as well as the last goal of the game, with the winner coming from a highly controversial penalty-kick. Real Madrid walked away of Alicante with the 3 points in their bag, but the home side got very close to cause a serious upset to the Spanish vice-champions. 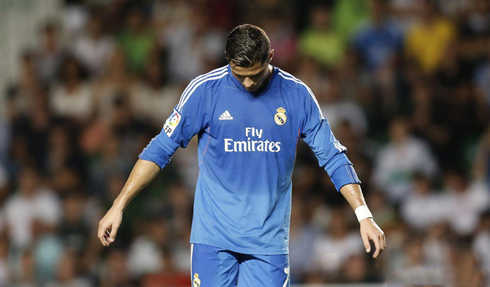 Madrid defeated Elche by 1-2 thanks to a brace from Cristiano Ronaldo, but the last goal of the game has only arrived in the sixth minute of added time and from a very doubtful penalty-kick to say the least. 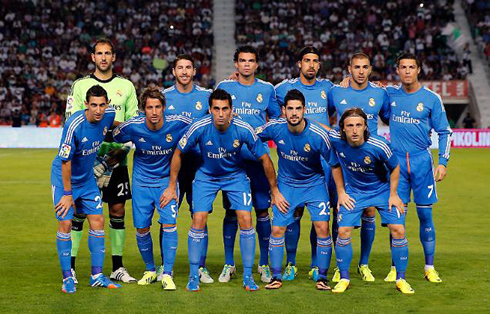 With this win, the Merengues managed to stay only two points behind both Barcelona and Atletico Madrid. This next saturday action returns with an exciting derby Real Madrid vs Atletico Madrid live at the Santiago Bernabéu. Judging from what we've seen this Wednesday night, Carlo Ancelotti's men will have to improve a lot if they do plan on defeating a very in-form Atletico. With Gareth Bale still resting for next Saturday's big derby game against Atletico Madrid, Carlo Ancelotti banked on Angel di María to partner up with Cristiano Ronaldo and Karim Benzema upfront. Midfield was expectedly composed by Khedira, Modric and Isco, while at the back Fábio Coentrão has finally made his return to the left side, Sergio Ramos and Pepe played on the center and Arbeloa got in charge of the right wing. Casillas remains benched when it comes to league games, which means that Diego López was once again Ancelotti's first choice for the goalkeeper position. The first-half showed us a very valiant Elche side, playing with high intensity and not giving too much space at the back to allow Real Madrid to play their usual game. The goalscoring chances were quite scarce and the Merengues can call themselves lucky by not having had one man sent off in the 35th minute of the first half. Sergio Ramos fouled Coro when the Elche forward was launching a dangerous counter-attack, but the referee decided to widen his punishment criteria and didn't show the Spanish defender the second yellow card as he most likely deserved. Without being able to dominate and control the game as they've wanted, it all came down to Ronaldo to make the difference on his own. Just six minutes after the break, the Portuguese forward took a free-kick on the left and struck the ball right past Elche's faulty man wall. The goalkeeper naturally ended up having trouble in seeing the ball coming his way and only got his hands to it a bit too late. Even though the shot wasn't as accurate as we're used to see in Ronaldo freekicks, it was strong enough to get past Manuel Herrra and put Real Madrid on the lead. The Merengues weren't playing very well until that first goal, but they certainly didn't mind going one up in a game where their opponent wasn't quite simply giving anything for granted. Elche were last in La Liga standings ahead of this match, with 3 draws and 2 losses, but had they played any of their previous game with half of the intensity and belief they've showed this Wednesday and they would surely be a few places up in the table by now. The Alicante side never gave up on getting back to level terms against Real Madrid and they got rewarded a couple minutes after the end of regular time. Albacar headed the ball to the back of Arbeloa for his teammate Fidel to explore the space that was left behind the former Liverpool defender. Without losing time, he immediately raised his head and crossed it to a dangerous area in the middle, looking for Boakye. The powerful Ghana forward had just escaped Sergio Ramos and Pepe marking and managed to head the ball without much opposition into the back of the net, leaving Diego Lopez helpless against such poor defending from his teammates. With only a couple minutes left to be played, no one at the stadium thought that the final score would still change at that time. Despite not having much time left to regain the lead, Real Madrid didn't throw the towel and kept believing it would still be possible to get off Alicante with a positive result. The miracle came on in the very last breath of the game, when we already into extra injury time, given over the initial added time. In the last play of the game, Real Madrid earned a corner kick on the right and as the ball crossed the penalty-area, Pepe and Carlos Sánchez seem to have pulled each other. The image don't seem very clear about who pushes who exactly, but as they went to the ground, the referee didn't hesitate much in pointing to the spot. Cristiano Ronaldo didn't get affected by the pressure and stepped up to score the winner for his side, his 6th goal in this La Liga campaign. 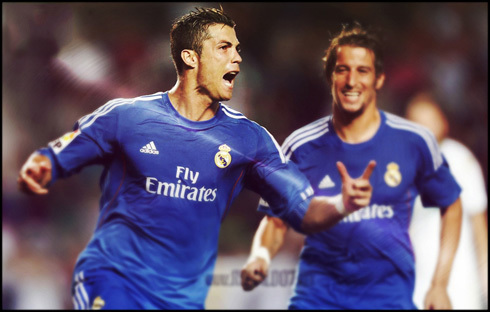 Cristiano Ronaldo next game for Real Madrid will be for La Liga, this Wednesday (September 25, 2013), against Elche. You can watch Juventus live stream, Real Madrid vs Atletico Madrid, Almeria vs Barcelona, Manchester United vs WBA and Tottenham vs Chelsea, all matches provided from our live football streaming section.